As a kid, I loved clam chowder, and it's still one of my favorites. It's a wonderfully creamy soup flavored with the briny clams, butter and (in the best versions) a little smoky bacon. But I'll never forget the time I ordered Manhattan clam chowder, not knowing it was something different altogether. "What is this?" I'm sure I asked my mom. What I think of as clam chowder is the New England variety, which is also popular on the West Coast: a creamy broth with onion and other vegetables, potato, clams and (if you make it right) bacon. Did I mention it's supposed to have bacon in it? My mom's version was so bacon-y, we called it her "bacon chowder." And Manhattan clam chowder is not these things. It has a thinner, tomato-based broth instead of a thick, creamy base. 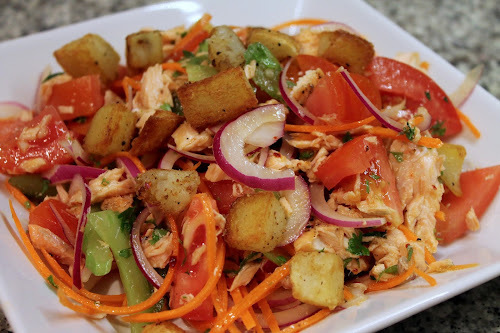 Frankly, it's just not as good, despite the fact that it's composed of so many things I love: onions, celery, potatoes and tomatoes (plus clams, which I don't "love," but are good when used right). With this in mind, I decided to take the parts I like about Manhattan clam chowder and re-fashion them as a salad. I kept the onion and celery, but included them raw. 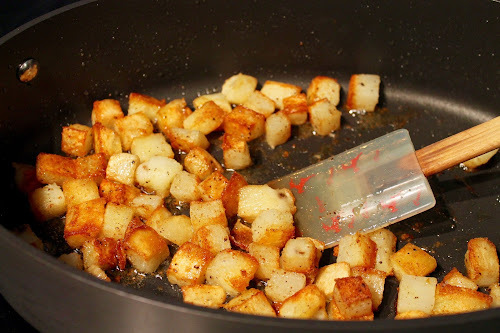 I fried the potatoes into cubes, which makes them a bit like croutons. Instead of tomato broth, I used raw beefsteak tomatoes. And I replaced the clams with salmon, which is much more flavorful for a salad. A garlicky white-wine vinaigrette pulls the whole thing together. 1. Fill a medium with 1 1/2 inches of water and bring to a boil. Add the potato cubes and cook until just tender, about 2 minutes. Immediately drain the potatoes and set aside in the colander for 5 minutes. 2. Heat 2 to 3 tbsp. of olive oil in a large skillet (use enough oil to coat the bottom of the skillet) over medium-high heat. Add the potatoes, season with salt and pepper, and allow to cook undisturbed for 5 minutes, then stir the potatoes occasionally until they are browned and crisp on all sides, about 10-12 minutes total. Remove with a slotted spoon and set aside on a paper-towel-lined plate. 3. Preheat oven broiler. Brush a foil-lined baking sheet with olive oil. Place the salmon fillet skin-side down on the baking sheet and brush the salmon with olive oil. Sprinkle with salt (if you have it, smoked sea salt is great here) and pepper and broil about 5 inches from the broiler for about 5 minutes. Turn the fish over and broil about another 5 minutes until the salmon is cooked through. Remove and discard the skin and any gray layer. 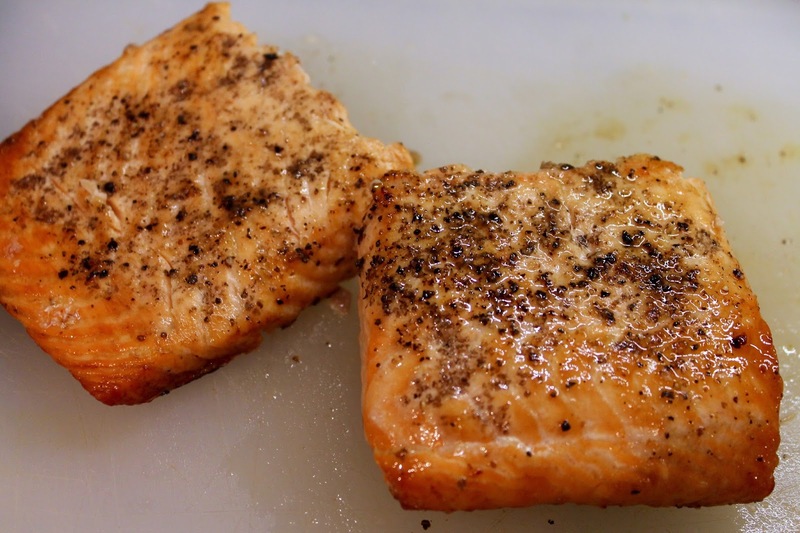 Transfer the salmon to a cutting board and flake with a fork into bite-size pieces. 4. 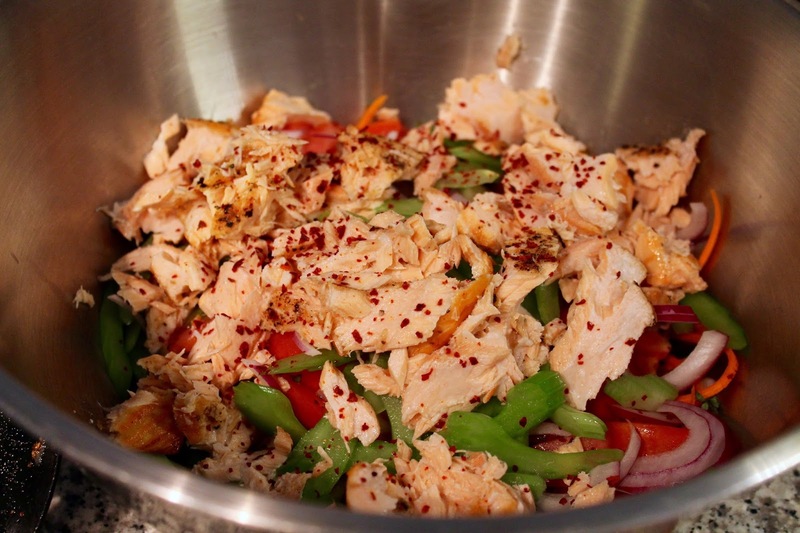 In a large bowl, combine the tomatoes, celery, onion, thyme, parsley, aleppo pepper flakes and salmon. In a small bowl, whisk together the garlic, vinegar and 3 tbsp. of olive oil. Pour the dressing over the salad and toss to coat evenly. Divide the salad into shallow bowls and top each with a handful of fried potato cubes.